Mix the olive oil, bacon bits, lemon juice, worcestershire sauce, salt and pepper to make the marinade. Prepare the cabbage. Rinse it under water and remove any yucky loose leaves. Cut the head in half on the core..then cut the halves in half again…to make quarters. Lay each wedge on a sheet of aluminum foil large enough to wrap it up in. Spoon about 2 tbsp of the marinade on top making sure to get it in all the nooks and crannies. 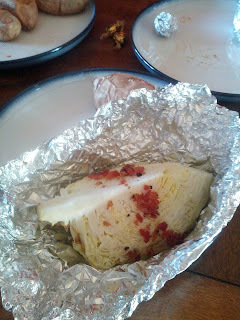 Wrap each wedge and bake for 20-30 minutes. I say 20-30 becuase they will continue to cook once you pull them out and I like mine still crunchy. Do what you please, though. Some in the comments section of this original recipe have cooked them up to an hour for softer cabbage.